A young Saudi student who won an international chemistry tournament has become a topic of social media discussions after he refused to stand next to an Israeli teenager waving the Zionist entity’s flag — instead choosing to stand next to an Iranian flag-bearer. 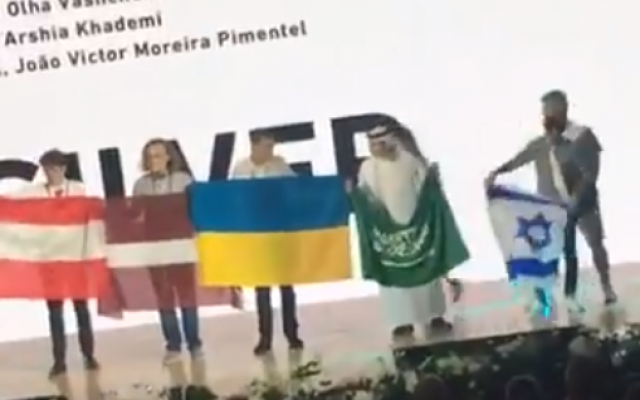 In a widely shared video, Saudi student Badr al-Mulhim is seen waving the Saudi flag after winning a gold medal at the 50th International Chemistry Olympiad in Slovakia and the Czech Republic, which ended on Sunday. But when an Israeli student who won a silver medal, is called to the stage holding an Israeli flag, Mulhim immediately moves to the far side of the stage, and ends up beside an Iranian student. This video is so meaningful !